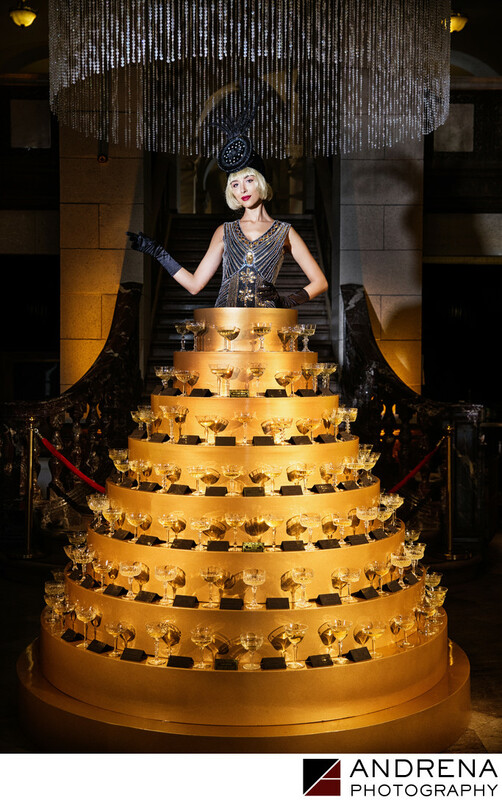 Bar and bat mitzvah guests love seeing new and unique ideas, and this creative champagne and placecard skirt structure, topped with a live Great Gatsby character, truly wowed those entering this incredible celebration at the Majestic Downtown. This display was situated right inside the entrance, providing a wonderful focal point for guests to chat about, be photographed with and to drink from. Bars were placed further back on each side, one for the kids and one for the adults. Professional lighting helped ensure that the gold skirt structure kept a high level of sparkle and shine. And the character on top was delighted to chat with awestruck children and their parents. This event was coordinated by Aliana Events in Los Angeles.